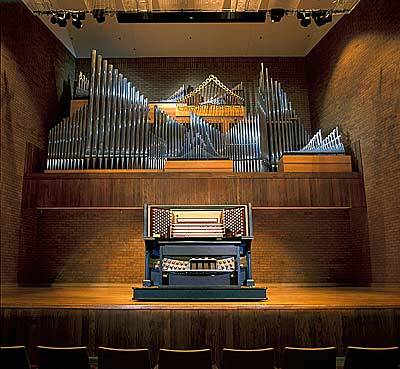 The BYU-Idaho Music Department is hosting a student organ recital on Feb. 7 at 2 p.m. Some of the participants are not even music majors, but they enjoy playing the organ. The event will be hosted in the Barrus Concert Hall and is free admission. An organ is one of the few instruments that can mix sounds of different kinds of instruments while playing it, becoming really close to an orchestra inside a bottle. The pipe organ is a musical instrument that produces sound by driving pressurized air through organ pipes selected via keyboards. It is the largest instrument in the world. Two of the students who are presenting at the recital on Thursday shared their thoughts and expectations about the organ recital. Rachel Morgan, a senior studying English, will be performing at the recital. Besides playing the organ, Morgan can play cello and piano, but she said neither instrument makes her feel like the organ does: it was the first instrument she enjoyed practicing. “The capacity of changing tones and the opportunity to be the whole orchestra really got me,” Morgan said. She expects the best, and she is excited to share her knowledge with all students. She hopes they experience feelings she felt when she watched an organ recital for the first time. “I could feel the sound waves in my ears, and the vibration back and forward,” Morgan said. Erin Jossie, a junior studying music, will also be performing in the recital. “We usually have three recitals all long during the semester, and I think it is a great opportunity for students to be able to perform for someone by themselves,” Jossie said. Created by Greek engineers, the organ has multiple keyboards or “manuals” that organists can play with their hands and feet. The largest organ, like the Wanamaker, can have 6. There are different types of organs. Some include pipe, theater and electronic, according to this website. The theater organ was created to replace the orchestra. The pipe organ uses air moving through the pipes to create sounds. Electronic organs produce sound through loudspeakers. The Church of Jesus Christ of Latter-day Saints owns one of the largest organs in number of pipes in the world. The Tabernacle organ, located in Salt Lake City, Utah, contains 11,623 pipes, 147 voices and 206 ranks. Listen to the organ here.